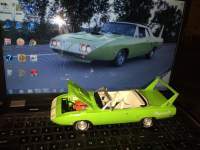 DodgeCharger.com Forum > Discussion Boards > Aero Cars (Moderators: Chryco Psycho, hemigeno, firefighter3931, Charger-Bodie) > 275 front tires? I thought I might have better luck here than the wheel/tire section as most probably don't want to do this. 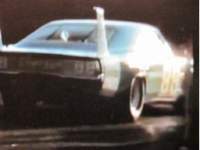 I don't have an aero car, just a 69 Charger but my question is, anyone run 275/60/15 on the front with a 15x8 wheel? Run them on back but don't think I would run on front. Depends on what you want to cut out that gets in the way. Here's what a 15 x 9.5 wheel looks like with an even bigger tire on it up front. I was that was the limit. Hoosier tires tend to run a little shorter closer to 27.25" still might not be possible even with stiff suspension and increased ride height. Let us know if you find a combination that works. Is that the actual Marty Robbins Daytona? Did it survive or is that a clone? No mistaking that paint scheme. I'm running Cooper 255/60R 15's on 15"X8" Tourq Thrust with 4.5 backspace on all four corners. When playing around with alignment I inadvertently got wheel rub at full turn. With stock standard-ish alignment specs they clear everywhere but some areas are pretty close. I had old 275/60/15 BFG Radial T/A mounted on 15x7 Slot mags on the front of my '69 for rollers in the garage and they rubbed pretty bad when turning. 255 is the biggest up front with any measure of safety. 235's always seem to drive and steer better on a B-BOD! Never trust a pretty girl, or a lonely midget. I run a 265/40/18 up front with a 4.5" backspace - no rubbing whatsoever.